ePublishing Knowledge BaseePublishing Knowledge BaseePublishing Knowledge Base Managing the websiteHow do I confirm my site on Google Webmaster, Bing Webmaster, Pinterest and other sites? So you need to prove you have ownership of your site to another site. That website provides you a unique code. Put it on your website. The Metadata Tool is your answer. 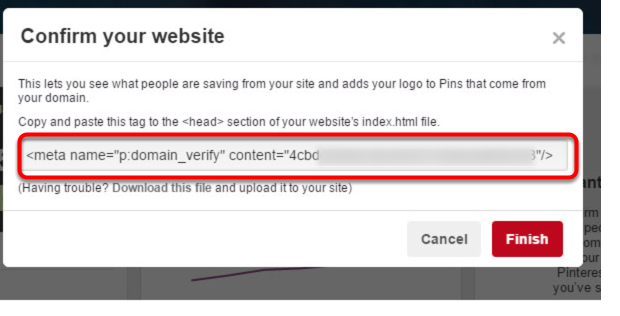 Below is a sample of code from Pinterest to be added to your site. There are two important things in this code sample: the name within the quotes following name= and the value within the quotes that follows content= or value=. NOTE: We blurred the actual unique number to protect the innocent. 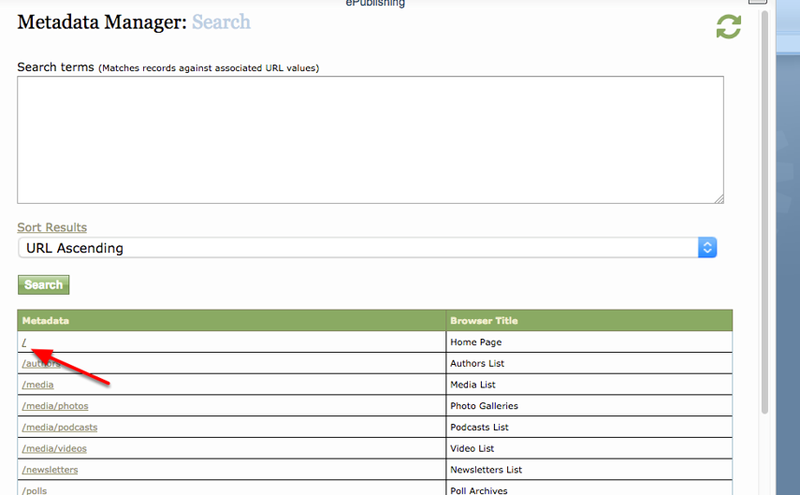 This is the metadata record for your homepage. Enter the unique meta header name / value pair provided by the third-party site. Scroll to the bottom of the page to the Meta Header Name / Value. Zoom: Scroll to the bottom of the page to the Meta Header Name / Value. Zoom: Type the header name. Clear site cache or wait. Either clear your website's cache or wait up to 4 hours for the update to take effect. Return to the website that requested you add the verification code to complete confirmation. If you have any questions, please contact your project manager. Prev: How do I control which default image is shared with social media? Next: How do I clear the cache on my site? I need to get a fix up quickly!